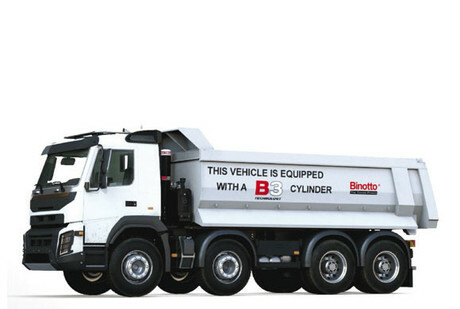 B3 is an exclusive Binotto invention which sets a new benchmark in tipping cylinders performance. B3 is an upgraded version of the special Binotto cylinder design, now featuring a unique cushion system. It provides improved safety, stability and durability, along with reduced maintenance and allows the cylinder to work at high speed with less risk. B3 is the technology the tipping industry was waiting for. After a 12-month long study and 2 years of testing hundreds of cylinders, Binotto finally revealed a new type of cylinder design during the 2014 IAA show in Germany. It was the birth of a new generation of cylinders for tippers. This new B3 Technology is an exclusive patented invention of Binotto. It consists of an upgraded version of the special Binotto cylinder design with a unique cushion system. The cushion system is already well-known for double acting/single stage cylinders in several applications to prevent «heavy impact» and consequent vibrations in the system damaging the vehicle/machinery. 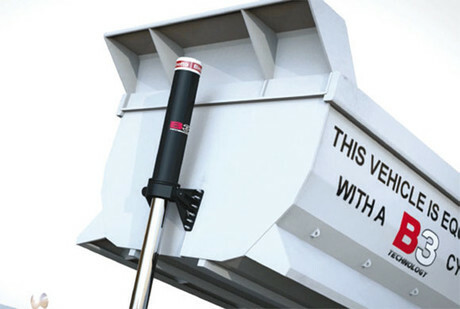 Featuring special seals, wipers, a lighter design (up to 3% less than before) and the innovative cushion system, the B3 telescopic front-end cylinders provide improved safety, stability and durability, along with reduced maintenance and allows the cylinder to work at high speed with less risk. Pressure has nothing to do with Speed: to increase the pressure of the hydraulic system will not make your tipping cylinder faster. Only with Binotto B3 Technology, cylinders can safely work at high speed. HOW TO IMPROVE THE SPEED OF YOUR TIPPING CYLINDER? The cylinder speed is determined by the oil flow provided by the hydraulic kit and the required oil volume for the cylinder displacement. Therefore, there are only two ways to tip faster. Reducing the size of the cylinder means to reduce the size of the working diameters of the tubes, therefore reducing the strength of the cylinder and increasing higher risks of cylinder failures. Some cylinder manufacturers offer higher pressure systems to increase the thrust on each stage to compensate for the smaller tube diameters, but this will not compensate for the lower performance and resistance to side loads and the distorting effects of the smaller size of the cylinder. In conclusion, this solution is not recommended because the benefit in speed are not significant in relation to the increased risk of cylinder failures. The second solution (recommended) consists of providing an empowered hydraulic kit for the same vehicle with the same application: increasing the flow rate (l/s) will reduce the time to reach the required oil volume for the same cylinder displacement. This preferred solution will allow high speed performance for front-end cylinder applications that none of current solutions could withstand, until the B3 design. 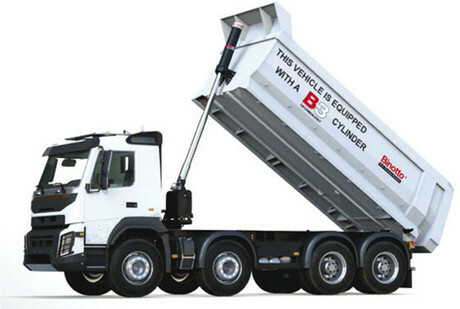 The B3 cylinder design makes the difference, introducing a new era in the tipping industry. Featuring the B3 design, with its exclusive cushion system and special seals, only Binotto cylinders are designed to safely sustain the increased oil-flow rate generated by an empowered wet kit. Furthermore, the new B3 Technology is applied to all the standard Binotto diameters, to ensure the same cylinder performances, maximum safety, stability and durability even when working at very high speed. B3 technology is now available for all Binotto front-end cylinders with usual diameters to provide you always high quality performance you are used to. 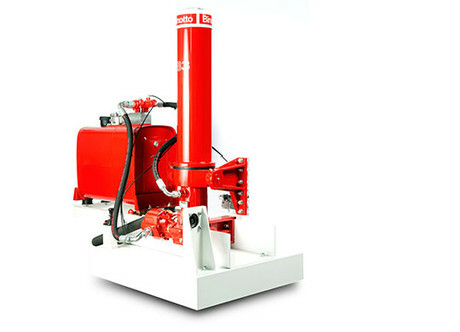 complete hydraulic systems for tipping vehicles. It is a prestigious brand highly rated for reliable and top-quality design. Binotto offers a vast quantity and variety of telescopic cylinders, with the widest range for capacity and product variations. Binotto production plants are located in Dueville (Italy – Corporate Headquarters) Stanghella (Italy), Flores da Cunha (Brazil) and Wuxi (China). Over 65 years old; serving more than 150 countries across the globe with subsidiaries, authorized dealers and specialized workshops; a team of more than 300 people; 50.000 square meters and a production capacity of more than 150.000 units per year. The customer oriented and quality based culture of its staff allows Binotto to offer high-performance and long-lasting products as a standard. This is why today Binotto is recognized as global market leader.